A New Day is Upon Us…. 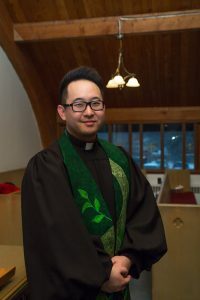 It is my pleasure to join the family of St. Timothy’s Presbyterian Church and surrounding Ajax area. It is also with great anticipation that we can come together as a people before our triune God in worship, fellowship, unity and enjoyment. With each day brings new challenges, but also excitement and I look forward to experiencing what God has in store for all of us. Our ultimate hope, joy, peace and love is found in our Saviour and Lord, Jesus Christ! I believe that together and with the help of God, we will experience the awe and wonder found in God’s glory. Christians – As we are led by the Holy Spirit in discipleship to be more Christ-like, may we take comfort in knowing that we are declared as God’s children. May we also take comfort in knowing that Jesus Christ sacrificed himself on the cross for all of creation so that we may be reconciled to God. Where once sin separated us from our eternal God, the Father, Jesus Christ made a way to reunite us forever! Let us take this journey together and walk in the footsteps of Jesus Christ, following after Him and helping others on this wonderful journey!